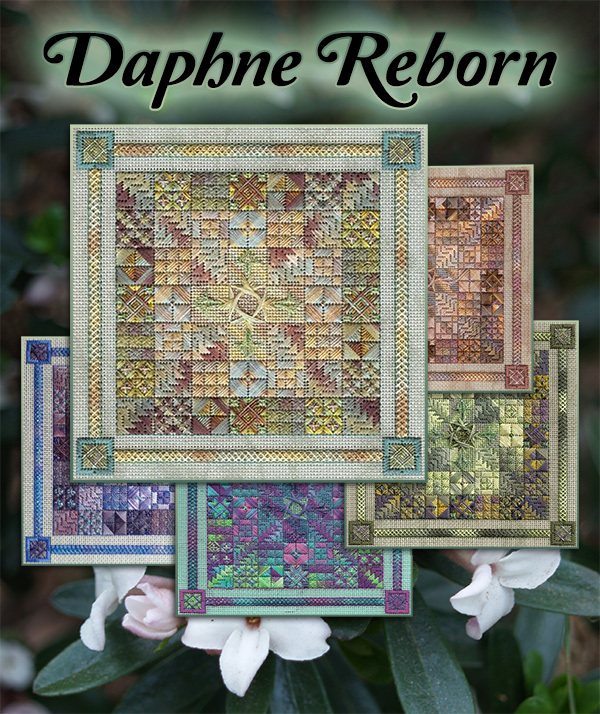 Daphne Reborn is an intermediate level counted canvas design. It is a quilt-inspired stitch sampler. The finished design size is approximately 6 ¼ inches square. The working canvas is 13 inches square. The design is worked on 18-mono canvas. It features threads from the Caron Collection: Watercolours, Wildflowers, Waterlilies, Impressions hand-dyed, and Soie Cristale and Kreinik Braids. Stitches used in the design include: basketweave, Walneto, Arrow Amadeus, Milanese, Scotch, Cashmere, bound cross, woven cross, giant rice stitch, Scotch cross corners, Rice stitch variations, star Waffle, double-wrapped Smyrna, backstitch, slanted gobelin, waffle, and a plaited couching pattern. This design uses creative thread blending in the needle to create a third color value from light and dark values of solid and hand-dyed threads. There are six colorway options included, each based on the Watercolours of the same name.